State street is full of spots to eat. Maybe even too full. The amount of resturaunts on state street may be kind of overwhelming, but do not stress. Over the course of the next 4 years, you will have plenty of time to hit all the good spots, like Short Stack and Graze. However, my biggest advice to you while walking down state street is to look up! There are many hole in the wall spots on state that you may not notice because signs are hidden. 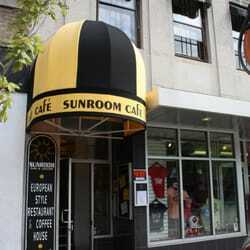 Well, look up to spot the awnings of some of the best hidden spots, like Roast and Sunroom Cafe. Both, reasonably priced and large dietary selection, Roast and Sunroom cafe pose as two of State St’s must eats. 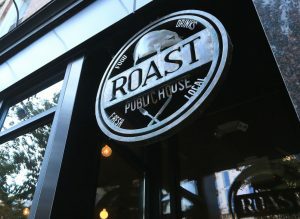 Roast is an artisan sandwich and craft beer joint. With a newly updated menu, theres something for everyone, from meat lovers to vegans. Likewise to Sunroom, an entree and drink will cost you around $15. Be careful if you come here on Game Day or weekends though, waits can get up to 45min-1 hour but its definitely worth it. Your new brunch spot, Sunroom cafe. Open at 7 am Monday-Saturday and 9 am on Sundays, this European style cafe is home to one of the best breakfast menus on State st. Like Roast, Sunroom offers vegan and vegetarian options for a sweet price. The tofu scrambler or lox bagel are a definite recommend. But it does not end there, Sunroom also has a lot to offer for lunch and dinner. From chicken salad sandwiches to Thai stir fry, the options are endless.